hooked up with Yasha and became one of the most high-profile and charismatic of the new generation of activists and quite outspoken. 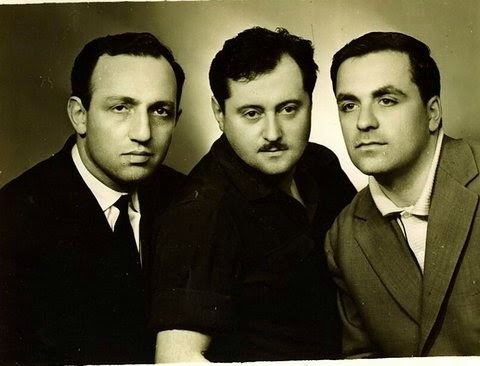 Eventually, they both went to the States* where I met them as an activist in Betar and the Student Struggle for Soviet Jewry ("Others such as Lenore Wolfson, Yisrael Winkelman (now Medad), and Beth Spiegelman [my wife] were outstanding."). 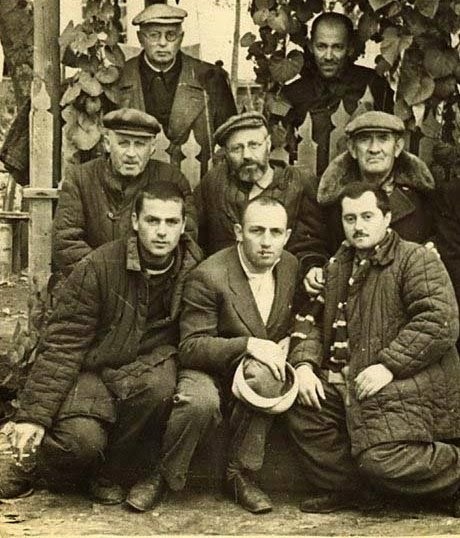 A friend of Yasha Kazakov accused the Israel government today of short circuiting the struggle by the 23-year-old Russian emigre to secure emigration rights for his family in Moscow. Boris Sperling claimed that the government did not wholeheartedly support young Kazakov’s eight-day hunger strike in front of United Nations headquarters in New York and actually “short circuited” it by calling on him to end his fast. Mr. Sperling, speaking at the Commercial and Industrial Club here, hinted at possible sympathy strikes in Israel. As long as the government fails to carry on the struggle in the way “we understand it should be conducted, we will abstain from our normal work and carry on the struggle openly, shouting aloud what we have to tell the world,” he said. Later, Dov tried to enter Likud politics but did not succeed or rather was basically prevented from succeeding and eventually became a Jewish Agency representative in Vienna. Although close for a brief period of a decade or more, I lost contact with Dov. He was handsome, energetic, impassioned, brilliant and a good person. Silva Zalmanson and Elie Valk, Chairman of the Association of Latvian & Estonian Jews in Israel, and family members also spoke. Let’s return to 1969 when you and Dov Shperling planned to travel to the States. We met many people. At a meeting with a group of officers I made the acquaintance of Arik Sharon and later Yitzhak Shamir—I was in his home, a small two-room apartment on the second floor. Geula Cohen once introduced us to an American named Bernie Deutsch. We told him the same story that we told everyone else. It made such an impression on him that he was eager to familiarize American Jews with this information. He began to plan a trip in conjunction with Jewish organizations in the States. He informed Nehemia about it and turned to Begin, the head of the right-wing opposition. At Levanon’s request, Begin tried to talk us out of the trip. 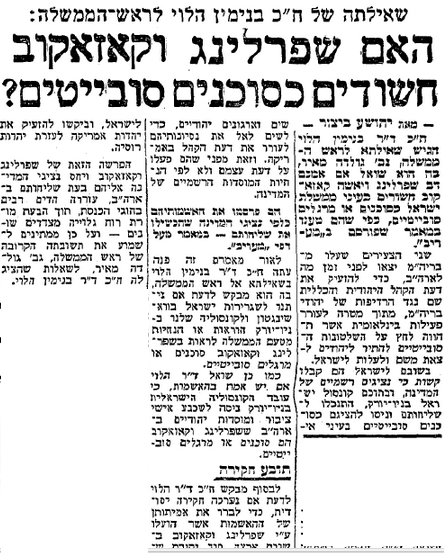 This Maariv story on March 2, 1970 is headlined: "Are Kazakov and Sperling suspect Soviet agents?" You were aware of it at the time? 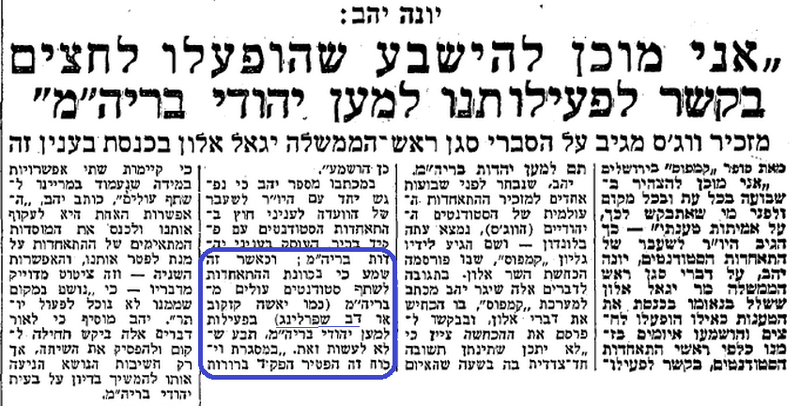 After our return Shperling wrote a good article in Maariv about how they hindered us and why. I wanted to sue them. The head of “Bar” in Israel and his representative in the States. But Geula Cohen dissuaded me. When we returned my parents were already refuseniks. After Shulamit Aloni’s speech in the Knesset and others’ remarks, the censorship in Israel was a little more accommodating. Then Geula said, “Let me interview you.” I agreed. Until then journalists were unable to interview you? They couldn’t publish it. Geula interviewed me at length and sent it to the censorship. The censor left about twenty percent. “This will anger the Soviet Union and aggravate relations.” Moreover, the censor demanded that it appear as if the interview had not been conducted in Israel and that my name not be mentioned. Geula did not agree with this decision and decided to create a scandal. After some struggle, they permitted almost the entire lengthy interview. It was published in two Friday editions, creating a strong impression in Israel. It included everything that I am telling you now and also information about the situation in Russia. Bernie Deutsch, who had arranged our trip to the U.S., then translated the article into English and disseminated it there. and I recall Abe Bayer blocking an entrance to prevent Yasha speaking, which was unsuccessful. Thank you for this post - very interesting! 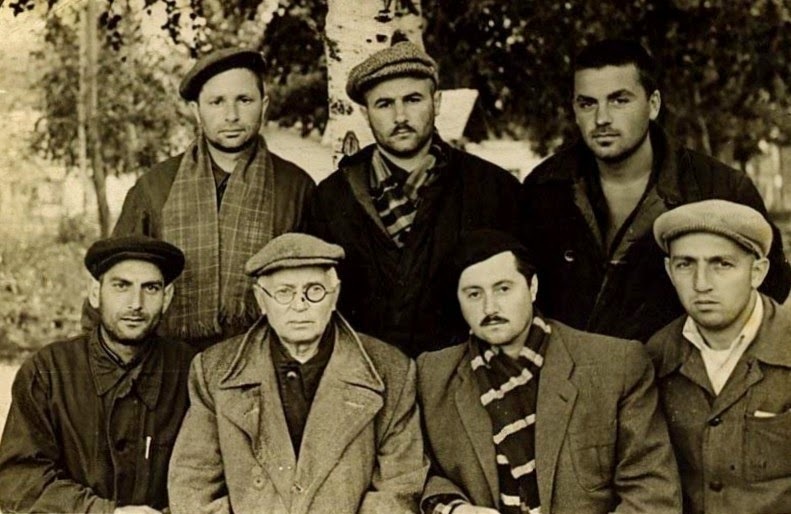 Dov Sperling was indeed one of the most important Jewish Zionist activists from the former USSR!